A rough-hewn necklace inspired by the majesty and sheer power of a flowing waterfall. 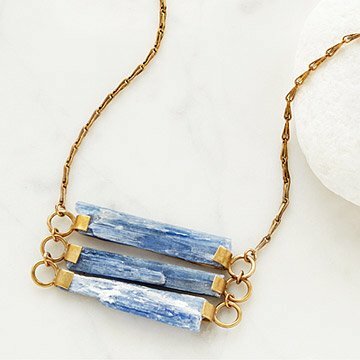 Inspired by the majesty and sheer power of a flowing waterfall, Emilie Shapiro's captivating kyanite necklace evokes the breathtaking natural beauty of this moving sight. Handmade in Long Island City, New York. Make it a set! Pair with the matching necklace and ring. Handmade in New York City. Clean with a mild detergent and a soft brush or a damp cloth. This necklace fits my style! Necklace is interesting & eye-catching. Outside the norm is my style - this fits the bill. I feel good wearing it. I look forward to seeing more of this artist's pieces. Great with those favorite jeans! This is a beautiful piece with a great organic feeling to it. Because of the natural kyanite used, each piece will be slightly different. I purchased it because the texture and color reminded me of the ocean, and it doesn't disappoint. The only thing I would like to see is an adjustable length- because it is long, it limits the neckline that I can wear it with.